The album, Santana's fourth, represents his full foray into the jazz-rock fusion that was beginning to gain acceptance during the early '70s -- if not in the mainstream, at least to an elite music-listening crowd. Although Santana III began the change, it was a mild step compared to Caravanserai. Besides the vastly altered musical direction, the band was shifting as well. Long-time bassist Dave Brown was replaced by Doug Rauch and Tom Rutley. Conguero Mike Carabello's spot was filled by James Mingo Lewis, while Armando Peraza contributed additional percussion. A Caravanserai was an inn where travelers could recuperate from their day's journey. Found in parts of Asia, North Africa, and southeastern Europe, they usually consisted of square buildings with an open courtyard in the center. The inimitable Jose Chepito Areas remained, but his role in the band is less-defined. Neal Schon is there too, but it's hard to pick him out in the mix. And Gregg Rolie's disctinctive organ playing appears only sparingly during a song or two; his vocals are buried as well. In fact, vocals appear on only three of the ten songs on the album. In hindsight, it's clear what Carlos Santana and the band are trying to do on this album, and one has to give them credit for the effort. The problem is, there were a lot of other bands during the same era that were doing it a lot better. 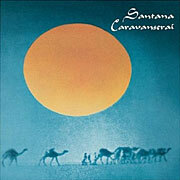 Camel, a British progressive-rock band seemed to have a much easier time of capturing the eerie, jazz-infused sound that Santana attempts on Caravanserai. And the Dutch band Focus (guitarists will recall the unmistakable song, "Hocus Pocus"), led by innovative keyboardist/vocalist Thjis van Leer and guitarist Jan Akkerman, were prolific in the same vein. In fact, one of the elements that seems to be missing from Caravanserai is any kind of cohevise musical hooks -- be they melodic, chordal, or rhythmic. Instead, the band relies on their chops to carry them through extended, formless jams that too often lack distinction. There are certainly some nice moments on the album. "Song of the Wind," written by Rolie, Santana, and Schon, is reminiscent of the lyrical "Samba Pa Ti." "Look Up (to See What's Coming Down)" has a smoldering Timbale solo. "Just in Time to See the Sun" is interesting for the foreshadowing of Journey's sound that you can hear in Rolie's vocal melodies; the same is true for Rolie's organ playing and Schon's guitar riffs in "All the Love of the Universe." And the classic Latin grooves on "La Fuente del Ritmo" render it arguably the best song on the album. In general, however, the songs meander aimlessly through uninteresting chord progressions, halting stabs at melody, and awkward transitions. "Eternal Caravan of Reincarnation" mimics a late-night jazz club feel, but spends too much time with odd sound effects. "Waves Within," basically a 2-chord song, is notable only for the ascending, sliding trill that Carlos later uses on albums like Sacred Fire: Live in South America. "Future Primitive," "Stone Flower," and "Every Step of the Way" never develop any memorable moments. The truth is, no one can be good at everything. Carlos Santana is a brilliant melodist, and his band are an incredible cadre of musicians. But on this album, they're playing a style of music that just doesn't fit their talents -- and it shows. There's no doubt that Caravanserai is a critical step in Santana's musical journey, but in and of itself, it is not one of his best albums.